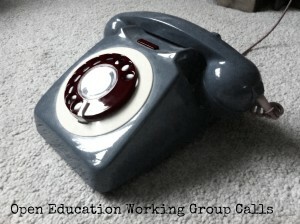 Sixth Open Education Working Group Call: Meta-Community Session! A new date for your diaries – our sixth Open Education Working Group Call: Tuesday 27 January at 4pm – 5pm GMT. This meeting will be slightly different to previous calls as we will be having a ‘meta community session’ or ‘open open session’ – an opportunity for different Open Education groups come along and introduce themselves. Each person will give a 5 minute pitch on their group, what it does, who it’s audience is, when it meets (online or offline), it’s unique selling points etc. We’ll then have a general chat about the challenges of sustaining an open education community reflecting on areas including national policy, funding, getting people onboard, bringing in new members etc. So far we have representatives from OER-discuss, P2PU, Alt-C education sig, OER-Research Hub, Software carpentry, Open Policy Network, SCORE fellows, Școala mea, CETIS and Wikimedia coming along! Make sure your group is represented! !